Sales Motivation Video: Fail Fast! Learn Even Faster! If you’re not failing, you probably aren’t learning all you need to learn. That’s right! I say, “Fail fast and learn even faster.” In sales and in life, we are all going to fail from time to time. Key is to take those experiences, learn from them, and move forward toward success. And be sure to check out my new book, High-Profit Prospecting. Here’s the link to order your copy now. Copyright 2016, Mark Hunter “The Sales Hunter.” Sales Motivation Blog. 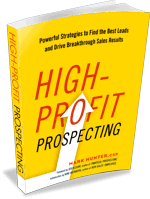 Mark Hunter is the author of High-Profit Selling: Win the Sale Without Compromising on Price and High-Profit Prospecting: Powerful Strategies to Find the Best Leads and Drive Breakthrough Sales Results.